Woven together from the actual experiences of people living under occupation, Tales of a City by the Sea is a journey into the lives of ordinary people in the besieged Gaza Strip. Jomana, a Palestinian woman living in a Gaza refugee camp, falls in love with Rami, an American-born Palestinian doctor and activist who has just arrived on one of the first Free Gaza boats in 2008. Their love is met with a relentless string of challenges. Ultimately, Rami must decide between returning to his comfortable life in Texas and staying in Palestine with Jomana. Choosing to stay means leaving his family and career behind for a life ravaged by war, while leaving means not only losing Jomana but also ignoring the plight of the Palestinians. Tales of a City by the Sea is about what it means to leave home to create a life in more tolerable conditions, and what it means to stay. It is about relationships between parents who have chosen to leave, and children who want to return. It is about how people in diaspora see their connection to home, and how people at home see them. It is a Palestinian story, but more broadly it is a migrant story. The play premiered in November 2014, with simultaneous productions at La Mama Theatre in Melbourne and the AlRowward Cultural and Theatre Society, in Aida Refugee Camp in Palestine. Both productions received overwhelmingly passionate responses from audiences and critics alike. In 2016, we hope to remount our Australian production at the La Mama theatre in Melbourne and then take it on tour to Adelaide, Sydney, Hobart, Casula and Byron Bay. Tales of the City by the Sea tells the story of people in terrible situations, living under occupation but it doesn’t define them by their suffering This is not the kind of story set in Palestine that you hear in the typical every day news reports — we hope to challenge this by telling a story that is not just about the conflict but the experiences of the people who live in and around it. We believe that sharing Palestinian stories represents a key step towards peaceful and just resolution to the conflict and that a view into the realities of life under occupation has the power to change hearts and minds and that is why we feel it is important that this story is told. Tales of the City by the Sea will feature a diverse cast and crew and help realize our hopes to see the diversity of Australia represented on the Australian stage. Our cast and creative team include both recently arrived migrants and multigenerational Australians. We have roots in Palestine, Lebanon, Iran, Iraq, Poland, Malta, Italy, Egypt, and Chile. Funding is the greatest challenge faced by this project, which is why we are asking for your support. The premiere last year was a co-share, this time, we want to be able to properly remunerate actors and artists involved in bringing this story to the stage. Your contributions go towards supporting a production that deeply values and wants to support its artists. We already have lots of wonderful in kind support such as accommodation but we are committed to paying our artists proper wages. We will also need to cover production costs for set and costume design, transport for equipment and cost of travel for the cast and crew. Raising this money will allow us to commit to the first leg of the Australian tour which means remounting in Melbourne with our artists on full wages regardless of money raised through tickets. That means any revenue raised through tickets will go on to support next leg of tour. So, let’s kick off our fundraising drive with this exciting event. 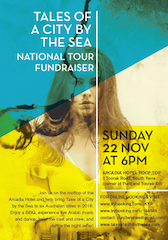 Please join us on the rooftop of the Arcadia Hotel and help bring Tales of a City by the Sea to six Australian cities in 2016. Enjoy a BBQ, experience live Arabic music, watch some amazing performances, meet the cast and crew, and dance the night away! Friends, this week our eyes were glued to our laptops watching in disbelief yet another horrible attack on the people of Gaza. We worried about our friends, partners and loved ones. Within theTales of a City by the Sea production team we worried about our partners in Gaza, our director Ali Abu Yassin and our representative in Gaza, Aya El-Zinati. Aya is a young dynamic and talented film maker and journalist who is the epitome of the human spirit we try to convey in our play. Before the war broke out, she promised to make a new video for our project. Imagine our surprise when she sent this email yesterday with a link to the video she completed while listening to the sounds of the falling bombs outside her window. With her permission, we are proud to share her email as it offers a deep insight into life in Gaza. I imagine this is not the right time to even talk about this but I know I have work to do. True, I’ve only slept two hours in the last three days, and I’ve been away from home most of the time but I have been thinking of you. I’ve been wondering how can I produce the video (Trailer for Tales of a City by the Sea) and what if something happens to me and I (die) before finishing it. So, every day at dawn I try to do more edits and I don’t know but I hope this time you will like it. Please believe me I’ve tried my best to do it better than the first cut. If you don’t like it and we remain alive I will do a better one for you. What is important is that I want to tell you a few stories we hear about the martyrs in Gaza. I want to tell you so you know what Gaza love stories are like in reality…in war… in these conditions. On the first day when 8 people were killed, one of them was from the Qassam brigade. His name was Abdlerahman AlZamly. He was engaged to a lady, maybe you’ve seen her in some of the photos that went viral as she was saying goodbye to him. They were engaged for a long time and couldn’t get married because they were waiting for the Rafah crossing to open and for cement to come into Gaza so they can finish building their house. All they needed was one ton of cement. Of course there were no crossings open and even if they were to open and if cement came in, they may not have afforded it because it would have been five times its actual worth. Yesterday, the Kaware family was martyred in Khan Yunis. Their house was bombed. Eight members of the family were killed and neighbours injured some have serious injuries. When I went to report it I almost had a breakdown. I told the photographer to take photos. My stomach turned. But I tried to be strong…to be normal. Yesterday a very young man Fakhr AlAjoory was martyred on his motorcycle and the scene was horrific. Before he was martyred he wrote a status on his Facebook: ‘when I die, some will mourn me, some will feel relieved, some will remember me forever, some wont care, but that’s o.k. it is enough for me to be going to a better place’. Last night they bombed the Hamad family. The family was sitting in their garden drinking coffee at night. The missile landed suddenly and the problem is the whole family died except for the youngest child, 5 years old, he is now orphaned and with no one left to take care of him. My father is a maintenance engineer at the hospital and because of the emergency situation there he doesn’t come home much. I try as much as possible to check on my mom at home in between my work shifts. Anyway, as I was walking to our house, I saw lots of nervous people in the street, some were running it turned out the neighbours were told to evacuate their homes because it will be bombed in ten minutes. I ran to my mother and told her to hurry up and leave. I told her they’re bombing the house next door. The problem is if a missile lands next door our entire house will be destroyed. I kept begging her to leave but she insisted on staying. She said she would never leave her home. I kept begging there was no time…I stayed with her preferring to die with her than to live and mourn her death. Can you believe the missile landed but did not explode? The authorities came and they carried it away. So we’re still alive. There is no safe place in Gaza at all. Every place is a target. This means Israel is bankrupt and has no list of targets so it just bombs sporadically at civilian structures. Despite it all, the poor people of Gaza still go out into the street, they buy food for Ramadan, they make kenafah and katayef for desert and they try to live the spirit of the holy month. What upsets me the most is that the situation in this city has become so painful. There are many who don’t have enough to buy food. And on top of that, there is war and destruction. Many live on handouts or borrowed money. Some people built their homes from borrowed money only to see their homes destroyed and with their home gone, so goes everything else they have. No one seems to understand the depth of our pain. Is it not enough we’re losing ourselves, losing our lives, losing our future, and outside, the rest of the world carries slogans ‘Gaza under attack’ or ‘Gaza under fire’ but listen first about what is really happening in Gaza. Some people even post the wrong photos from Syria or from Iraq this made the international media discredit what’s really happening here and this played to Israel’s advantage. But believe me what happened here in the past three days is a massacre. What also really upset me and frustrates me is that no one is telling our stories. Our real human stories. They talk about us as enemies or they reduce us to numbers and statistics. I am sorry I’ve given you a headache with my rant. But I really wanted to talk to you and tell you our stories. I’ve been in Gaza for nine years now and in that time I’ve lived through three wars. Each war has many stories. If I don’t die in this war, I will write a book about those three wars….hahaha…I remember how innocent I was when I came here and how this place made me a human being. Seriously. I think as much as I am tired of being in this place, it has given me life. On 23rd of December 2013, Bethlehem Unwrapped festival opened with the unveiling of a 8m high life size replica of the separation wall that has been built by Israel in the West Bank. It has been constructed over 8 days in the church yard of St James’ near Piccadilly Circus in central London in a bid to bring some reality of what it is like to live in Bethlehem in 2013. Gordon Rich-Phillips, Member for South Eastern Metropolitan Region, today congratulated Narre Warren artist Samah Sabawi, who is among 85 artists and organisations across the state to share in the latest round of $1.3 million of Victorian Government arts grants. Mr Rich-Phillips said Arts Victoria’s new grants program, VicArts Grants, sought to support projects across all art forms by some of the state’s most exciting independent artists and arts organisations. Samah Sabawi will receive a $10,000 grant to present a theatrical journey into the lives of the playwright, a Palestinian Australian, her family in Gaza and the events experienced over several years. Taqi Khan, under the auspices of Multicultural Arts Victoria Inc, Hampton Park, has also received a grant of $15,000 to be used for a significant project for Melbourne’s local Afghan Hazara community, encompassing contemporary and traditional Hazara music, singing and poetry. “I am pleased that our local arts sector has been recognised in this statewide program and I look forward to seeing the projects as they come to fruition,” Mr Rich-Phillips said. Overall, the latest round will create career development opportunities for more than 2200 Victorian artists. The VicArts grants program, announced as part of the 2013-14 State Budget, is aimed at streamlining the process of applying for a grant while opening up funding opportunities to innovative ideas. “Grants recipients include artists at all career stages and overall, more than a third of the recipients are receiving government funding for the first time,” Mr Rich-Phillips said. The next round of applications to the VicArts Grants program will close in March 2014, for projects commencing in July.